Hotel 3 stars Superior cosy with swimming pool, ideal for the beach holidays in the family. 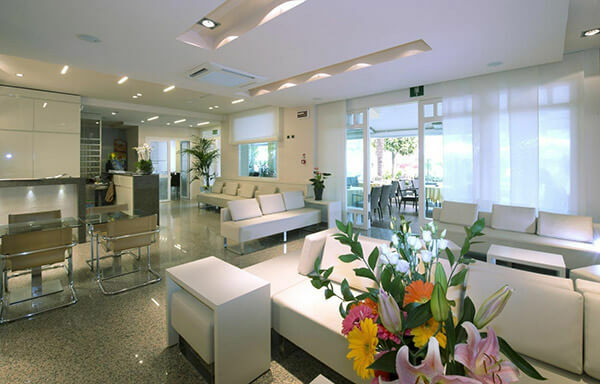 The location just a few steps from the sea and from the centre make the Hotel Rosenblatt of Cervia, one of the places in Romagna, where it is pleasant to stay and spend some moments of health and fun for the holidays with children. The modern ambience, thefamiliar atmosphere, the delicious cuisine and the experience gained over the years ensures impeccable services, research in the quality of the food and professional hospitality of the guests. Our outdoor area for pleasant moments of relaxationat any time of the day. A welcoming and comfortable place where you can read a book, listen to music, or just to chat. Professional Staff, fresh and genuine products offered in the sophisticated menus, sweet and savory breakfast and variations of the menu are the main features of our restaurant. Garden play Area, animation for children, with activities and workshops, swimming pool for children, personalized menus, flexible meal times and much more for the safety and entertainment of your children. An oasis of wellbeing and fun for the whole family in the centre of Cervia. A large heated pool with a hot tub for the relaxation of adults and a small children's pool with a fountain for their enjoyment in safety. Also available a fully equipped gymnasium for fitness lovers.